Dimensions: 19.5" x 9.2" x 19"
Silentaire DR-500 Super Silent Compressor is one of the noiseless airbrush compressors from Silentaire Technologies. Over the years Silentaire Technologies produces compressors of the highest quality and remains the leading manufacturer in the industry. The company delivers the quietest compressors for airbrushes along with the premium technical support for their products. Beyond that, their main objective is to ensure the positive airbrushing experience for the customers through trouble-free operation yet availability of the air compressors. That is why the Silentaire product lines contain a number of compressors of various designs. Each of them is specifically developed to meet particular airbrush needs so that you will find the right fit exactly for your projects. Silentaire compressors of the Super Silent line offer even more comfort for their users. For one thing, these powerful compressed air units are highly efficient in terms of air supply capacity. That is the key to achieving a smooth and precise application of spraying materials. For another, the Super Silent air compressors are perfect devices to assist those seeking silent running operation. Moreover, such compressors provide a fully automatic working process. Which means that you don't have to keep constant control of the operating pressure but enjoy the airbrushing. When the pressure in the tank rises to the maximum allowed level, the pressure switch automatically stops the compressor. Once the pressure level is reduced to the minimum, it starts working again. a carrying handle. Along with the suitcase design, it makes compressors easily portable. This compressor will be a good choice for various airbrushing projects as well as for tattooing and medical industry applications. To secure the long-term performance of the air compressor, observe a common duty cycle of 15 minute periods. This means that you should run the motor for 15 minutes and then give it a rest to cool down. 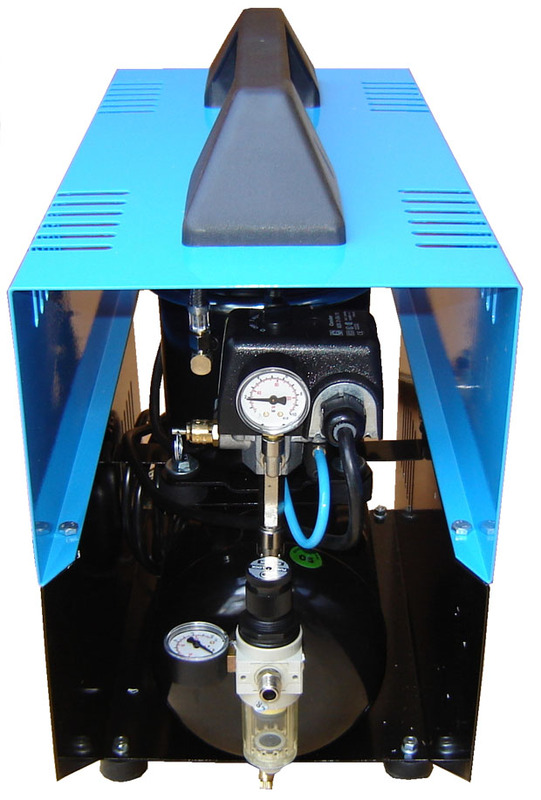 Apart from the compressor itself, the DR-500 Super Silent Compressor packing also includes oil bottle type SINCOM/32E, instruction manual, and a tank certificate. The warranty for Silentaire DR-500 Super Silent Compressor covers 12 months from the purchase. Under this guarantee, you have the right to a free repair and replacement of defective parts. Identifying parts as such is performed by the manufacturer. Please note that the electric parts and worn parts are not subject to the guarantee. Ensure also that the compressor has not undergone tampering and bad usage. Otherwise, the guarantee automatically ceases. 19.5" x 19" x 9.2"
24" x 22" x 13"